Martin was raised by his mother and stepfather. After growing tired of being physically and mentally abused by his stepfather, Martin ran away to the streets where he started sniffing glue, begging and stealing for food. After living in the streets for three years he was brought to Global Hope Rescue and Rehabilitation Center by a village elder in the slum of Mathare. Martin didn’t stay long, and continued to run away from the center and only come back when he was hungry. It wasn’t until he was brought to the center by the police that he decided to stay. 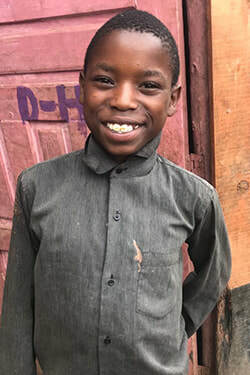 He has stayed at the center since December of 2015, and has proved to us that he is dedicated to return and remain in school - we just need to find him a sponsor to pay for his school fees!